When I sit down to describe Masooma’s works, the list reads like a flippant dismissal and in some cases even a bohemian protest of what is conventionally considered “beautiful” or acceptable. It is a statement of sorts: Cardboard mosques, whisky bottle caps and birds, the grand arches of Alhambra reduced to a minute flimsy paper model, tawdry amulet earrings, a sculptural piece made of cheap lingerie and feathers ala Moulin Rouge, prancing deer made of hair, witty subtexts and a hastily drawn film actress caught with her mouth open. What a visual conundrum! The names of alcohol bottles become titles. Necklaces of human nails imply adornment and majesty. Kitsch is celebrated. Convention is flouted. Slickness is derided. The importance of preservation and permanence in an artwork is looked down upon. Could it be more antithetical to system, order and function? Chutzpah! She wears her art too. Apparently it also resonates. Let’s talk about hierarchies. And that too on many levels! It is perhaps this homage to human flaws, an almost unabashed honesty in the use of material, emotion and content; raw and spontaneous and what she likes to call “flimsy” that draws us in for such lack of pretense belies the complexity of her works. 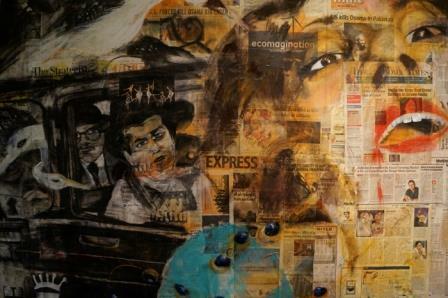 This is particularly evident in her most recent body of work titled “Sublime West” which was exhibited at Galleryske in New Delhi. 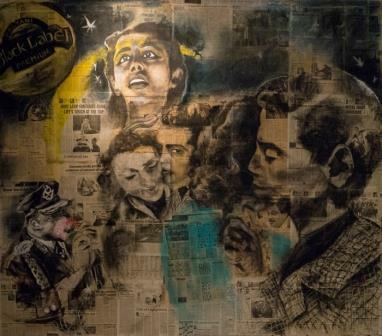 Large scale drawings that partially resemble cinematic stills have been executed in mixed media on old newspaper. Text and image are intertwined, their functions are in flux for as a woman languidly opens her rufescent lips in surprise, we are simultaneously drawn to the parallel drama being played out in the background which is a mosaic of printed headlines functioning as subtext; the words “India Inc sees red in delay over green nods” become just one of the identifiers for a larger drama being played out. Bearing this image in mind I question her on these images in relation to a love for cinema and text. “I thrive on the act of unfolding.” says Masooma. The conversation is replete with such poetic statements. Her honesty and sincerity is disarming while her passion for the art of “making” or rather the process of it defines her. We delve deeper into this and it turns out that her love for the ephemeral and the flawed is also driven by the urge to make “the leftovers important” and “damaged things beautiful”. She has the desire to travel. Her constructed spaces and their deliberately “flawed” and raw execution represent a flight to a new realm that then becomes a vessel for other narratives to come into play. 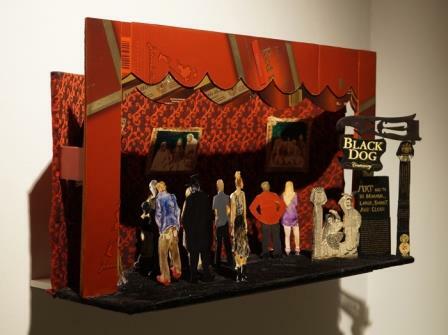 This is embodied in her staged tableaus that again reference her love for cinema where one of her most recent set of elaborate dioramas shows a man beating a woman while a crowd of people have their backs turned to us; the words “Black Dog” and “Art has to be Minimal, Large, Smart and Clean” are featured on top of the couple. 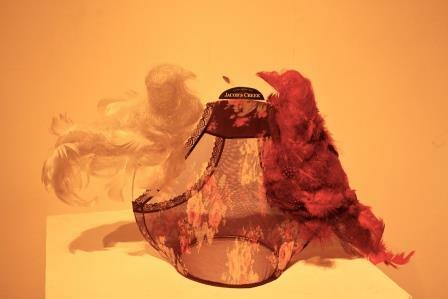 Such critique coupled with her wit then makes her unassailable and she admits, when talking about her jewellery, that like her dioramas, it is again a tongue-in-cheek visual comment that debunks the belief that art must be slick and suave in presentation in order to elicit a certain response. We keep coming back to her love for text, its recurring role in her works, her poetic sensibility and most importantly the unique titles that often evoke a puzzled chuckle. 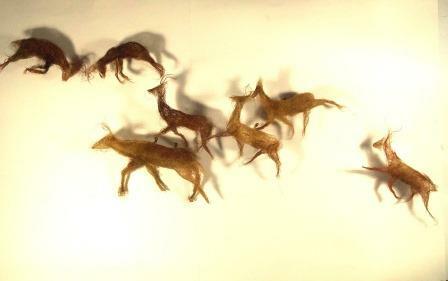 Memory, she says plays an important role in her work. The moment, such as in her drawings, becomes important along with the text. Simple. Playful. Bordering on impertinence? 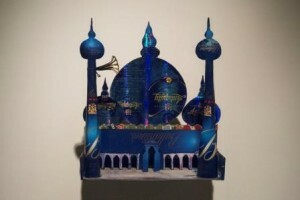 Not so much and that is the illusion at play when we talk about one of her recent works, a model of a mosque facade that blazes shades of synthetic candy blue.The psychedelic interplay also allows our eyes to travel across the text in gold. The words “Ballantine” and “Antiquity”, names of alcohol labels run across it. Masooma references Bahlul Dana, a wise man in the times of Haroun-ul-Rashid as her inspiration, a man who drew buildings on sand and called it heaven. Constructed from the cardboard material of a local Indian whisky brand, it then also becomes a paradoxical statement of our visual culture and times today. Masooma Syed’s future plans include a 1 month stint at the Theertha International Art Residency where she aims to concentrate on experimenting with more jewellery pieces.